Newton Minnow, former director of the F .C. C., described the world of T.V. viewing as a “vast wasteland.” But when a pure devotee of Krishna (God) appears on television, the whole performance becomes surcharged with bliss. When television, with its complex technological setup for reproducing a picture in thousands of T.V. sets, is used for the purpose of glorification of the Supreme Lord by a pure devotee, it becomes spiritualized. Whoever sees and hears a pure devotee talking about the nature of God and the eternal soul becomes liberated from all misery. This is an actual fact and can be investigated by any inquiring philosopher or scientist. 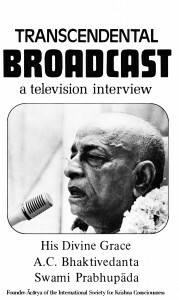 To download Transcendental Broadcast — a Television Interview with Srila Prabhupada please click on the book cover image on the left. On July 29, 1971, His Divine Grace A.C. Bhaktivedanta Swami, the author of Bhagavad-gita As It Is, arrived in Gainesville, Florida, to speak at a large student gathering at the University of Florida. Taking advantage of his presence in Gainesville, which His Divine Grace described as “a remote corner of the world, thousands of miles from the birth place of Lord Caitanya” (the incarnation of Krishna who appeared 500 years ago in India to teach the Hare Krishna mantra), the local T.V. station arranged for this interview. Lord Caitanya predicted that His philosophy of the Absolute Truth would be spread to every town and village in the world. As clearly taught in the Vedic scripture Bhagavad-gita, it will reveal to us that our real self is not the body but an individual spiritual soul and that Krishna is the Supreme Spirit, the Soul of all souls. The nature of the spirit soul is eternally fresh. It cannot be destroyed, broken or contaminated. Because he is a pure devotee, Srila Prabhupada can speak from the transcendental platform of Absolute Truth. We have prepared the text of this interview so that the serious reader may repeatedly read it and study the spirit soul in action. As we have stated, this was not an ordinary television performance. A serious man wants to know the Absolute Truth in order to solve the problems in his life. Thus Bhagavad-gita advises him, “Just approach a spiritual master.” Who will not be eager to listen for his own benefit, when God reveals Himself through the words of a pure devotee?